See detailed instructions, below, from Bacharach user manual. The Bacharach True Spot(R) Smoke Test Kit determines efficient combustion and is internationally recognized as the standard method for evaluating smoke density in the flue gases from distillate fuels. Too much smoke is one of the most common causes of excessive fuel usage and expensive service requirements. That is precisely why the smoke test is an indispensable part of any oil burner service job; and with the True Spot, an accurate smoke reading takes less than a minute. 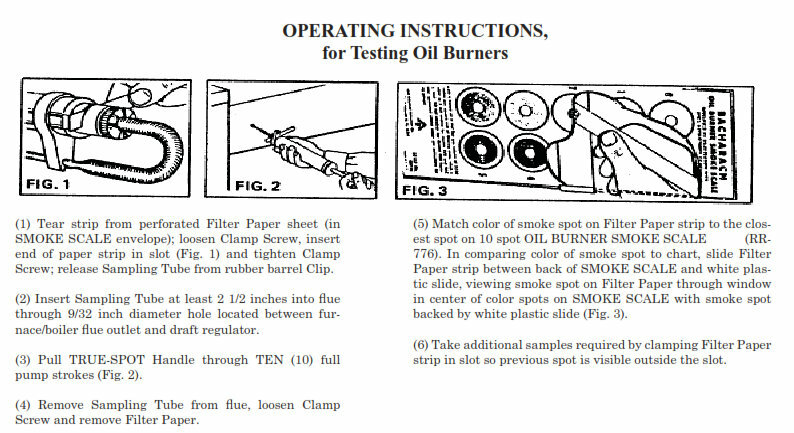 The True Spot smoke test method has long been recognized as the accepted standard for oil burner smoke tests. It is used by Underwriters Laboratories in approval testing of oil burners; and it is the test method specified in the Installation Standards of the National Oil Fuel Institute by U.S. Department of Commerce, Testing materials (D2156-65),and German Standard DIN 51-402. 126 TruReward$ points will be placed in your account when you buy this item.